Is a mission dedicated to our founder, Prof. Manfred Fuchs, who died early this year. The mission is a lunar flyby of a spacecraft that is attached to the last stage of a Chinese Long March 3C rocket. The launch is foreseen for end of October 2014. 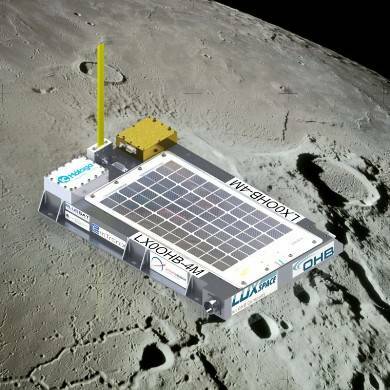 The spacecraft will be part of the last stage of a lunar mission, due to be launched end of October 2014. The trajectory will be a lunar flyby and return to Earth, with 90% chances of re-entry in the atmosphere. The 10% remaining chances lead to a very interesting orbit. The nominal mission duration is 196 hours, 8.17 days. The nominal Lunar flyby will occur on the 28 Oct 2014 00:28:00.000 UTC at 373000 km distance to the Earth, and 13000 km over the Moon surface. The continuous transmissions will start 4670s (77.8 minutes) after launch (-0, +600s). Five successive 1 minute sequences are sent during the 5 minutes cycle. 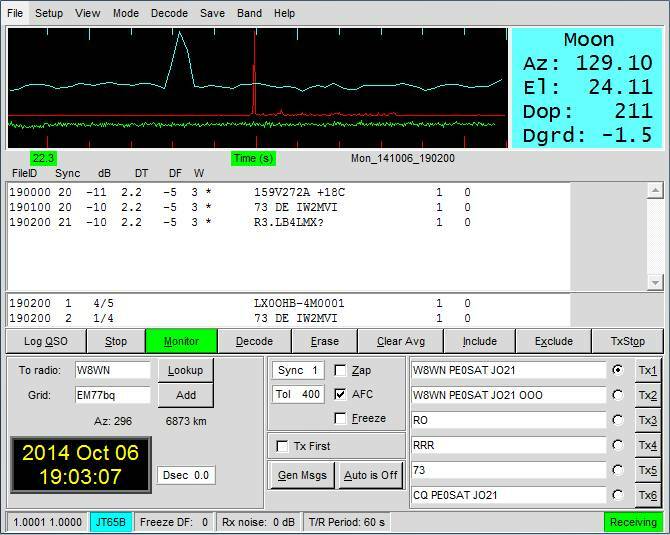 The digital mode JT65B will be used, this can be decoded by radio amateurs using the free WJST software, there will also be ‘human readable’ tone transmissions. For the use of this software from Princeton University, follow this link.The transmission will start 4670s (77.8 minutes) after launch. The last 4 figures are the mission elapsed time in steps of 5 minutes. 167/12 = 13.917 Hours in this example. field is always 13 characters in length, with ‘V’ at 4th position, ‘A’ at 8th position and ‘C’ at 13th position. The following is decoded using WSJT9 and a 4M JT65B example audio file. The following is a tentative set of orbital elements that should remain valid from the launch to at least up to the 27 October when using usual classical and simple tracking software that do not integrate Moon. The launch is foreseen for end of October 2014 with a Chinese Long March 3C rocket. Current launch date is 23 October at 1800 UTC. 4M (Manfred Memorial Moon Mission) main website. Stay tuned for the latest news on the 4M Blog.